You really must go on an East London walk, beyond Tower Bridge, on the south side of the river. You’ll find that the crowds just disappear almost the moment you through the whitewashed underpass that takes you under the bridge. All traffic goes west, heading toward Southbank, where the crowds are. Head east and you are almost immediately rewarded with cobbled streets and river-side architecture, some of which survived the WWII bombing and more recent demolitions, to become 150 years old. Walking down Shad Thames past the old wharf buildings, one gets the occasional peek at the Thames itself. Be vigilant about the Thames Path signs all the way along– you will often be cast away from the river side itself to a block back from the river, so take advantage of the moments when you can actually walk along it. Along the Shad Thames is the Design Museum, although this will be moving to Kensington very soon. Past here you will quickly find yourself at Jacob’s Island, once described as “the very capital of cholera”. At low tide, it is easy to recognise this as the place where the villainous Bill Sykes meets his sticky end in Dicken’s Oliver Twist. The mudflats add an oppressive air to the air when the tide is out, and the poverty described seems within easy reach. But with the tide up, the area is transformed into an attractive riverside community, so very far from what it once was. Dickens influence is also felt further on, with a number of housing estates named for him and the inspiration of his works. People are enjoying the summer – walking a dog, playing football, washing a car. Along Bermondsey Wall East, we cut back into the Thames Path, which takes us into a riverside seating area. Here, a couple of families from the surrounding homes have come to watch a middle-aged man practice the fire-stick juggling he is obviously just learning. It looks as if it could develop into a communal gathering – a bonfire, or a picnic. Someone films him as he juggles, and one of his sticks is blown out by a gust of wind. Further along Bermondsey Wall East is the Angel pub, right beside the river. There is a green space across the road from it, upon which sit the foundations of Henry III’s Manor House. Henry could once step right off the royal barge onto his front steps, but there has been reclamation of the river bank since those days, so now the Manor House sits well back. The ruins – or rather the remnants – are plain to see, and amalgamate into the area perfectly well. A group of people sit along a wall having an erudite conversation lubricated by pints of beer they have carried across the road. Someone says the word “prescient” as we go past – a rich word, a word I love. A little girl fires a little plastic arrow out of a little pneumatic cannon and across the ruins, perhaps through the bedroom window of King Henry himself. Keep as close to the river as you can along Elephant Lane, and you will go past a large two storied building that looks tall and important. I suspect it has some history, but can see no indication of it. We pass the Kings Stairs Gardens, a large green mound, with a group of fellows standing with beer cans in their hands. They look good natured and seem to be having a jolly time. Along here, keep an eye out for river-side access as you get some wonderful views back toward the City, an unusual angle. The City has very often seemed distant and unattainable to this area. 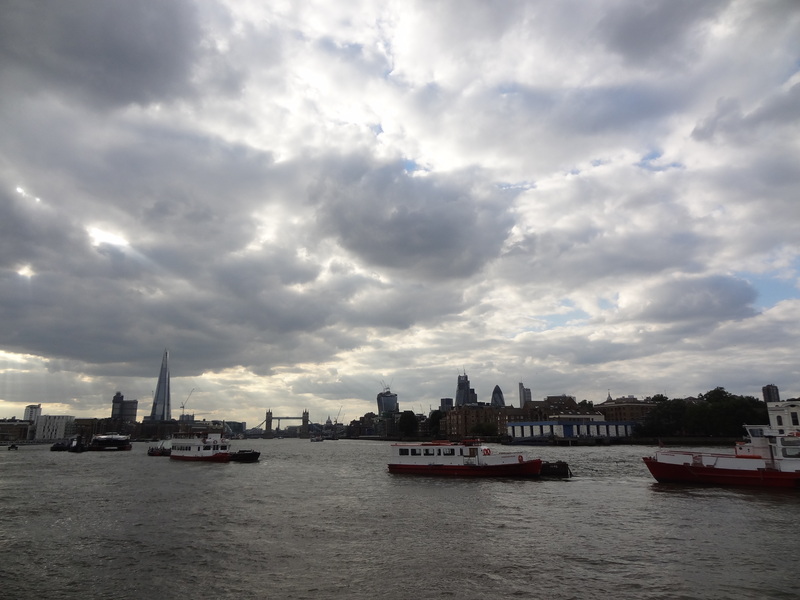 Carry on along the river, down Rotherhithe Street. There are lovely apartments with pot-planted walk-ways that run across the road at about three levels up. I watch jealously as a tenant has a cigarette and a drink, and wanders back and forth along the walk-way, lost in thought. You will go past the Mayflower pub, and the Church of St Mary the Virgin. Carry on, just a bit further. On the corner of Rotherhithe and Railway Streets sits the Brunel Museum, an homage to Isambard Kingdom Brunel and his father Sir Mark Brunel. Underneath your feet lies the tunnel they gouged out from the earth. This is the first tunnel dug under a river in the world and is still used by the Overland trains that pass between Rotherhithe to Wapping, 170 years later. Isambard began his engineering career here, under the gaze of his father. He nearly drowned on this very spot after a tunnel collapse, which would have deprived the world of his genius. He built bridges, massive boats, and railways across the world, all the while inventing and innovating. Sit in the Museum Garden, with a Mint Julep from the Midnight Apothecary, and raise your glass to the man’s brilliance.